The 26th edition of the Valero Alamo Bowl will see the Big 12 Iowa State Cyclones against the Pac-12 Washington State Cougars, as the Cyclones are looking to secure their first title here on their debut, while the Cougars are hoping to get the second title on their second appearance here. The Cougars are favorites at the -2.5 spread with the total at 57 points and Washington State at -145 money line odds. 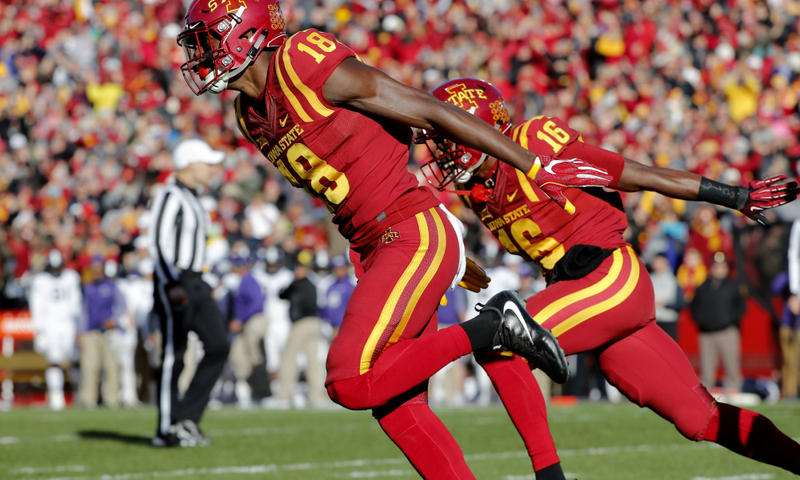 Iowa State was in an excellent form of five consecutive wins when Texas snapped their positive run but the Cyclones responded with a couple of victories over Kansas State, and most recently, the Drake Bulldogs. The Cyclones were 24-20 down until the final minute when Deshaunte Jones caught the 7-yard pass from Brock Purdy in the end zone to give his team a 27-24 win with only 26 seconds to go. It was the Cyclones’ only passing touchdown of the tilt but they recorded three on the ground as David Montgomery dominated with 145 yards and two touchdowns on 33 carries and had way more yards than all Drake’s running backs (58). Freshman quarterback Brock Purdy is completing 66.3 percent of his passes for 1935 yards with 16 touchdowns and five interceptions for the Cyclones. Purdy was quiet in a win over the Bulldogs as he threw for 153 yards and a touchdown but will have an opportunity to post a 200+ yard display against Washington State’s defense that is allowing 208.8 yards to the opposing receivers. Hakeem Butler will serve as Purdy’s top option in the passing situations as the wide receiver collected 1126 yards and nine touchdowns this year while running back David Montgomery will continue to shine on the ground as he already recorded 1000+ rushing yards with 12 touchdowns. Iowa State’s coach Matt Campbell extended his deal with the team and he and his staff will get $1 million raise as a part of the deal. Iowa State has the 83rd offense that is averaging 26.8 points per contest, while their defense is the 36th in college football as it is allowing 22.5 points per game. The Cyclones’ passing game is the 63rd in the country as they are averaging 234.8 yards, while their running offense is 114th as they are recording 124.3 yards per game. Washington State was in a great run of seven victories but the arch rivals the Washington Huskies defeated them to win their second Pac-12 North Division title in three years. The Cougars scored season-low 15 points in a 28-15 loss as they collected just 237 yards in opposite to the Huskies’ 487 and they were held off the scoreboard in the opening and final quarter. Washington State, who has the best passing offense in the country, was completely stopped through the air as they had only 152 yards and no touchdowns, and the poor running game couldn’t help the offense to avoid the defeat even though James Williams added two touchdowns on the ground. Senior quarterback Gardner Minshew is completing 70.6 percent of his passes for 4480 yards with 36 touchdowns and nine interceptions for the Cougars. Minshew had the worst performance of the season and one of the worst of his career as he threw for miserable 152 yards and two interceptions but will be eager to bounce back against Iowa State’s defense that is allowing 228.8 yards to the opposing quarterbacks. Dezmon Patmon, Davontavean Martin, and Easop Winston will provide Minshew support in the air as the trio of receivers have 2000+ yards and 20 touchdowns this year, while running back James Williams has 552 yards with 12 touchdowns on the ground and also 560 receiving yards with four touchdowns. Washington State has the 15th offense that is averaging 38.3 points per contest, while their defense is the 39th in college football as it is allowing 23.1 points per game. The Cougars’ passing game is the best in the country as they are averaging 380.0 yards, while their running offense is the second-worst as they are recording just 81.8 yards per game (129th). These schools haven’t met before and I am leaning toward the Cougars whose head coach Mike Leach has way more experience when it comes to bowl games than Iowa State’s Matt Campbell. Leach led his teams to 14 bowl games before this and has six wins and even though the Cougars lost the previous two bowl appearances, I am backing them to get this one. Campbell, on the other hand, will appear in his sixth bowl and he won the last year’s Liberty Bowl against Memphis Tigers, his first with the Cyclones, but will find it hard to win here. These teams are combining for around 55 points per contest and considering the total of 57 for this encounter, we should expect to see under 57 points here. Under is 5-0-1 in Cyclones last six Bowl games; under is 4-0-1 in Cyclones previous five non-conference games, while under is 6-0-1 in Cyclones last seven neutral site games. I am going with under because under is 7-0-1 in Cougars last eight games following a double-digit loss at home; under is 4-1 in Cougars previous five vs. a team with a winning record, while under is 7-2-1 in Cougars last ten games following a straight up loss.